Product information "WSA01-iM880B - WiMOD Shield for Arduino"
The WiMOD Shield is a expansion board that enables users of Arduino™ / Arduino-compatible boards to use WiMOD radio modules based on LoRa™ technology. Arduino™ boards are microcontoller-based boards that allow the user to do simple designs and prototypes or experiment with microcontroller circuits in general. The boards offer an interface for extending the basic functionality like sensors and actors by just stacking the extension boards to the base board. 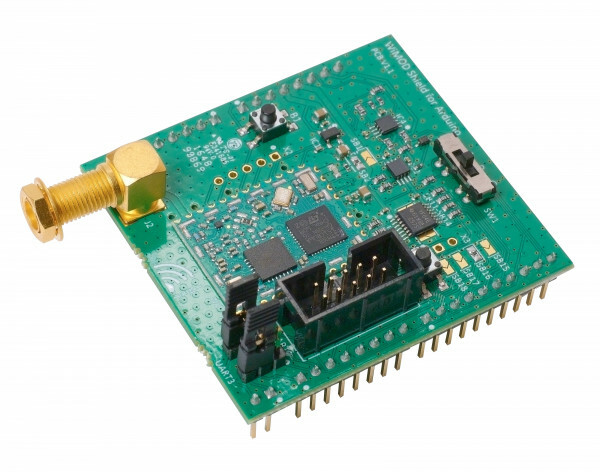 The WiMOD Shield is a small and low cost extension board that can be attached to the top offering an radio interface based on the LoRa™ technology. The shield is an interface card for connecting a WiMOD radio module to an Arduino™ board. The Shield includes everything that is needed for connecting a WiMOD module to an Arduino™ board. The power supply is sourced by the Arduino™ board and the I/O logic levels are adjusted by integrated level shifters. The SMA connector offers the possibility to add virtually any suitable antenna to get a good performance. The Shield offers two possible UART connections, so it can be used with Arduino™ UNO-like board and with Arduino™ DUE-like boards. For the latter one an additional UART can be used exclusively for the radio module communication. Besides the hardware board a example software library providing an easy access to the WiMOD HCI interface is available. The library is compatible to the Arduino™ IDE an can be installed by a simple import of the given files. This makes a complete example showing all steps of processing WiMOD's HCI messages on the low level side. On the high level side the library offers a bunch of simple API commands that control the WIMOD modem firmware. Hence a prototype of a LoRaWAN™ end-node can be created in minutes. This evaluation board/kit is intended for use for ENGINEERING DEVELOPMENT, DEMONSTRATION OR EVALUATION PURPOSES ONLY and is not considered by IMST GmbH to be finished end - product fit for general consumer use. Related links to "WSA01-iM880B - WiMOD Shield for Arduino"
Customer evaluation for "WSA01-iM880B - WiMOD Shield for Arduino"